New Year is a traditional Lahu, Which corresponds to January of every year, this tradition is to bake a dessert ” Kaow pook” and bring the pines were planted four from the central courtyard of the village, a four-sided. And a woven grill by wood, and then bring it to the middle of the four pine trees and bring food to people considered a sacrifice to the grid that will include rice, Head and other flowers. 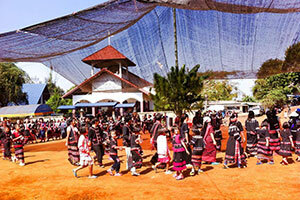 And there will be dancing This folk dance of the Lahu tribe. The dance will be retrograded to dance every day during this traditional. This tradition has 8 days and 7 nights. It is the tradition of the village close to other villages nearby. For other villages to come together, which will be circulated to each village started well and ended well. In the afternoon, pouring water on the day of the adults in the village. The Cooking will entertain guests at the event. It is a traditional dish Such as potato curry Fried vegetables. In this tradition, remembering the night with firecrackers Along with dance. And a top racing games on the Lahu tribe. The next day from the end of the tradition. Lahu people will not go out of the house. It is believed that if go out of the house will have bad luck and bad luck were met.